Back in stock soon. Inquire prior to ordering. The material vintage style knicker set has a rich look to it with a very subtle thread weave black on black pin stripe that adds a textured look. The detachable suspenders are of the same material as the set. 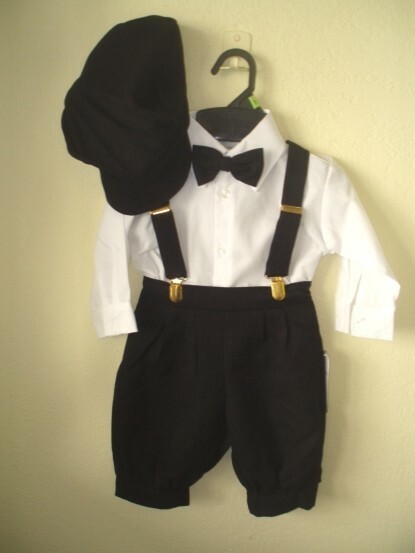 The 5 - Piece Set includes a cotton poly white dress shirt, and nice quality polyester knicker pants, cap, suspenders and bow tie. Note - the socks are sold separately. From Shannon Kids USA. Runs on the small side. Refer to the size chart. Go up a size when in between or at the top of the range. Customize a period or golf look with optional colored or argyle knee socks, suspenders and / or bow ties. Popular choice for weddings and pictures. Refer to the height / weight chart and order up if near the top of a size and choose carefully.